Your favorite product: Puzetové earrings made of surgical steel, white flower rose from the resin, 14 mm S84.11 - is added to the wish list. 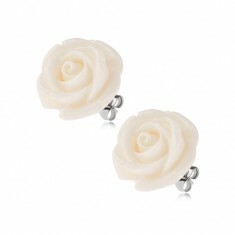 Steel earrings with puzetovým stainless steel, polymer flower rose white color. 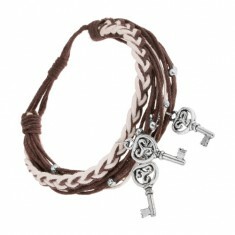 Your favorite product: Adjustable šňůrkový bracelet, dark brown and white color, steel keys SP80.07 - is added to the wish list. Knitted bracelet, dark brown and white saved string, small steel balls, three pendants - an ancient patinated keys of steel. 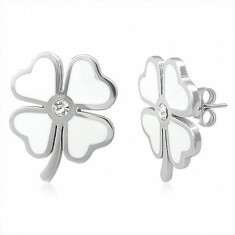 Your favorite product: Earrings made of steel 316L, white glazed four-leaf clover for good luck X02.07 - is added to the wish list. 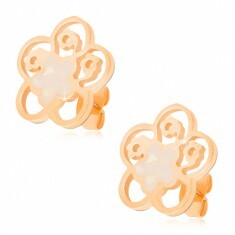 Steel earrings in the shape of a cloverleaf in white with clear zirconia in the middle, puzetové fastening. 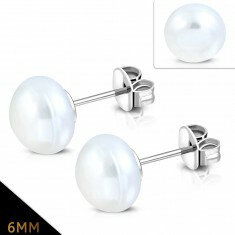 Your favorite product: Puzetové steel earrings with balls in the form of white beads X26.11 - is added to the wish list. Earrings made of surgical steel with white pearls and puzetovým button fastening. Your favorite product: Steel pendant golden color, white pearly heart in the outline of a heart S54.06 - is added to the wish list. Gold pendant of steel, the contour of the heart, asymmetrical white pearlescent heart. Your favorite product: Gold earrings made of steel, white mother-of-pearl heart in the kontuře heart S54.01 - is added to the wish list. 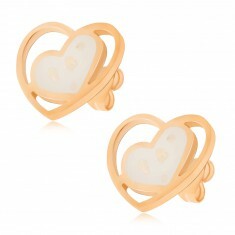 Steel earrings gold color, puzetové fastening, the outline of the heart, pearlescent asymmetrical heart. Your favorite product: Steel pendant golden color, mother-of-pearl carved flower AA25.07 - is added to the wish list. Gold pendant from surgical steel, the contour of the flower, white pearl flower. Your favorite product: Puzetové earrings steel gold colors, carved flower with a mother of pearl Z28.2 - is added to the wish list. Earrings made of steel, shiny golden surface, the contour of the flower, white pearl flower, puzetky. 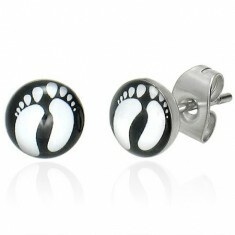 Your favorite product: A steel fake ear plug, white glazed circle, Greek key, 8 mm PC01.05 - is added to the wish list. A fake ear piercing made of steel, shiny wheels, the motif of the Greek key, white glaze. Your favorite product: A steel piercing in the chin, colored spots on a white background PC09.17 - is added to the wish list. Piercing in the chin, labret, steel, glossy surface, the header embedded in the glaze, the color of the blot. Your favorite product: A steel piercing to the tongue, white acrylic beads with the advent wreath SP10.05 - is added to the wish list. Piercing the tongue out of surgical steel, white balls of acrylic, glossy finish, the advent wreath with a bow. Your favorite product: Earrings made of steel, gold color, stripe inlaid čirými rhinestones S72.09 - is added to the wish list. 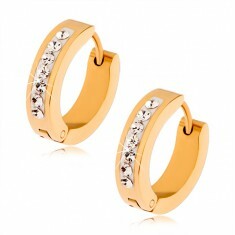 Shiny steel earrings gold color, a vertical white stripe sequined čirými cubic zirconia, toggle fastening. 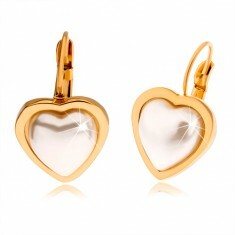 Your favorite product: Steel earrings gold color, a pearly white stone in the shape of a heart S85.07 - is added to the wish list. Shiny earrings made of steel golden color, pear-shaped, embedded white heart reminiscent of pearl button fastening on the women's patent. 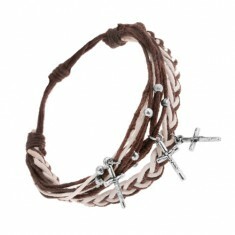 Your favorite product: Adjustable šňůrkový bracelet, dark brown and white color, steel crosses SP80.13 - is added to the wish list. Bracelet of dark brown and white motouzků, small steel balls, three pendants - a Latin cross with Jesus Christ.